The intoxicating scent of baking cinnamon rolls will be the perfect weekend wake-up call. Homemade, warm, and comforting—extra large cinnamon rolls are topped with an ooey-gooey cream cheese frosting. In an electric mixer fitted with dough hook attachment, combine melted butter, milk, and sugar. Sprinkle with yeast, and stir. Add in flour, baking powder, and salt, and mix until dough ball forms. Cover with plastic, and let sit at room temperature for 1 hour or until dough has doubled in size. While dough rises, in a medium bowl, stir together butter, sugar, cinnamon, nutmeg, and clove until smooth. Set aside. Scrape dough onto a floured surface, and knead for 4 minutes until dough is elastic and firm, not sticky. Roll out into a rectangle, and spread with filling. Cut into 4 strips, lengthwise, and roll each into a cylinder. 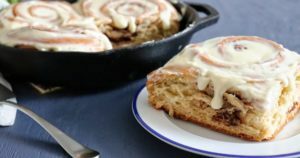 Grease cake pan or skillet with butter and add cinnamon rolls. Gently press rolls down, flattening slightly, and cover with plastic wrap. Let sit for 1 hour or until rolls double in size and fill pan. Preheat oven to 350°F. Cover pan with aluminum foil, and bake for 40 minutes. Remove foil and continue to bake for 30 minutes or until golden brown and cooked thoroughly. While cinnamon rolls are baking, combine icing ingredients in a electric mixer fitted with a paddle attachment. Whisk until smooth and creamy. Set aside until ready to serve cinnamon rolls. Remove rolls from the oven and let rest for 10 minutes. Spread with icing before serving. Tip: Jazz up your cinnamon rolls with fresh berries, chocolate chips, or sprinkles. ****Don’t forget to take a photo after you make this and use hashtag #SGPartners to get registered to win prizes. Follow us to stay up to date on everything!